At Follow the Leader we always like to be as fair as possible. If we can, we like to equally represent both sides of an argument, issue, or criticism. Following my harrowing experience with my own dog after a Vet visit last week, Jon wanted to let everyone know how wonderful his own experience has been at his Vet. If you’ve had a great experience with your Vet leave a comment! Like I said last week in my post, nobody’s perfect, and we certainly would never expect that of Veterinarians working in an ever-changing field with difficult cases that require split-second decisions. Enjoy! I wanted to share a great experience I had at my vet clinic. 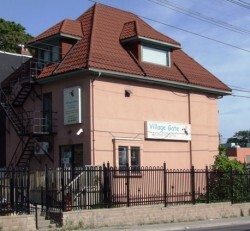 I have been with my vet at the Village Gate Animal Hospital since it opened about 10 years ago.I had met Doctor Toole in the neighborhood and often had good chats with him. He always struck me as being very knowledgable but also a very caring doctor who was passionate about what he does. It was for this reason that I chose him as a vet for my dogs. Last year my dog Hailey got very sick. She had to stay at Village Gate for weeks at a time and would come home briefly before having to go back to the vets. Any time I went to visit, I was alway kept up to date on what was being done and how Hailey was doing. It was not only Doctor Toole who made me feel comfortable, but Jillian, the receptionist, and the entire staff. I knew that each person there personally cared about what they were doing and about every animal that was taken there. Unfortunately, Hailey was very sick and ended up passing away. Although it was a very sad occasion, the care and respect I received made an otherwise difficult time, a good experience. I am extraordinary grateful for the love and care they gave to Hailey in her final weeks and to Doctor Toole and everyone at Village Gate for the care and compassion they showed to me.